Four husbands and she didn't know she could cook until she made stuffing. 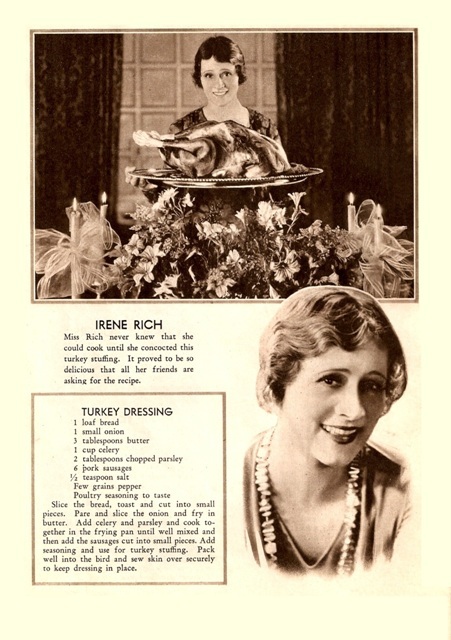 Here’s lovely silent screen star Irene Rich, in between stints of playing straight woman to Will Rogers or quietly suffering in her popular series of “neglected wife” roles, serving up the Thanksgiving bird. Rich was a fine actress, but not fine enough to convince us that turkey is anything other than a studio prop. Her recipe for stuffing seems genuine though and might be worth a try. At the time Rich was serving up this phony bird she was living rather elegantly in a grand 1923 English brick home @ 626 South Windsor Boulevard in tony Windsor Square replete with a third floor ballroom/billiard room. Columnist Lee Shippey dropped in on Irene in 1930 and gave this account: “When we called at Irene’s house she and her two daughters were dressed in beach trousers and short sleeved shirts. That is their favorite house dress. She led us into a charming room in which two big pictures stood out, one either an old master or a very old copy of one, a sort of madonna-and-child picture, and the other a softly sunlit landscape by Swinnerton. She offered us a cigarette, but didn’t care for one herself.” Perhaps that’s one reason Irene lived to 96 and Shippey only made it to 85! 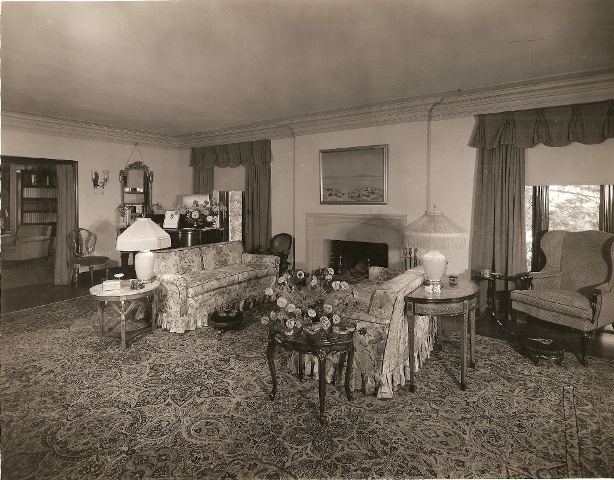 Irene Rich's Living Room. The Jimmy Swinnerton admired by Lee Shippey is over the fireplace. 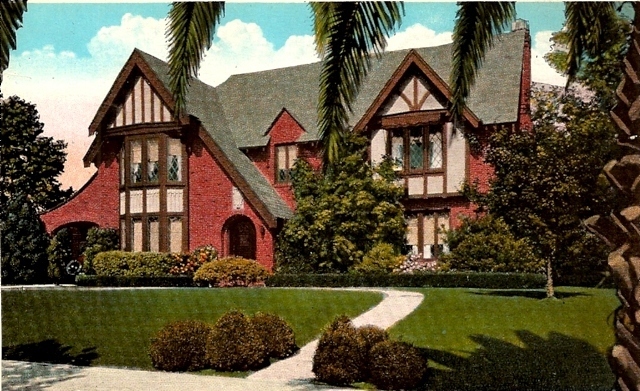 This entry was posted in Recipes, Windsor Square and tagged Cooking, Holidays, Thanksgiving, Will Rogers. Bookmark the permalink. 1 Response to Nothing Says Happy Thanksgiving Like a Papier Mâché Turkey!